A Williston Park restaurant is getting some time in the spotlight on Tuesday. 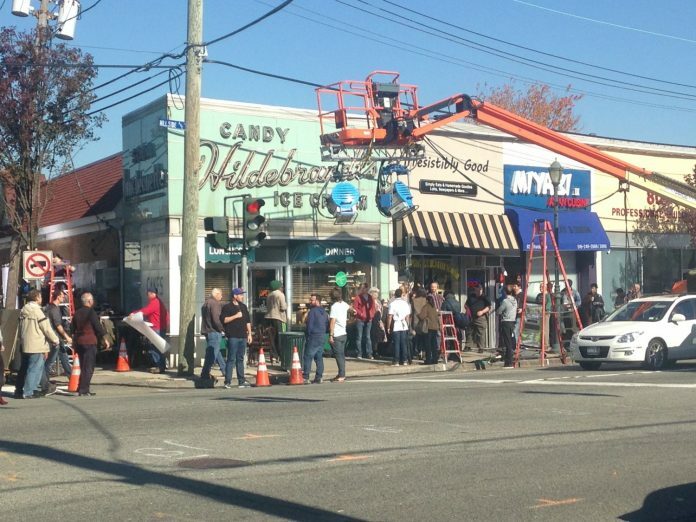 The crew filmed inside the restaurant and along tree-lined Cross Street to give the film a “picturesque and beautiful” suburban backdrop, location manager Tom Dunn said. Watts was on set in Hildebrandt’s, which serves as the diner where her character works as a waitress in the film. This week wasn’t the first time the ice cream shop has gotten screen time. It was featured on the Food Network’s “Diners, Drive-Ins and Dives” in 2011, which is how location manager Christopher Menges found it, Dunn said. Wheatley School alumna Stephanie Donnelly also shot a four-minute short there last year for her New York Universiy graduate film program. “The Book of Henry,” set to hit theaters in 2016, follows Watts’ character, a single mother of two sons who learns important lessons from one of them, a child prodigy, when she has to confront conflict in her neighbor’s home. Village of Williston Park Mayor Paul Ehrbar said this is the first “full-blown” movie shoot that he’s seen in the village. He said the production group approached the village about filming a couple weeks ago. Film shoots are good for the village, Ehrbar said, because they give business to local restaurants and draw attention to the area. “It’s good for the community,” he said. “It puts us on the map a little bit better. Besides Williston Park, the film has also shot at Grumman Studios in Bethpage and in Hudson Valley locations including Nyack, Mount Vernon and Croton Gorge Park, spokeswoman Amy Johnson said. Filming is expected to finish just before Thanksgiving. Ehrbar credited Building Inspector Kerry Collins and the Nassau County Police Department for making the shoot run smoothly. Police are conducting intermittent traffic control on Cross Street between Winthrop Avenue and Meagher Place on Tuesday, but no roads will be completely closed.